Meriones is a name that appears in Greek mythology, coming to the fore during the Trojan War, when Meriones appeared as one of the Achaean heroes. Meriones was a Cretan by birth, born to Molus by a woman called Melphis. Molus himself was an illegitimate son of Deucalion, son of Minos, and so Meriones ancestry could be traced back to Zeus and Europa. More importantly, during the Trojan War, Meriones’ close family included Idomeneus, Meriones effectively being Idomeneus’ nephew. It was occasionally said that Meriones was a Suitor of Helen, although this view was not universal, but nevertheless, when Agamemnon called for an armada of ships to retrieve Helen from Troy, Meriones, along with Idomeneus, sailed to Aulis. ​Some call Meriones squire to Idomeneus, whilst others claim that Meriones was co-leader of the 80 Cretan ships that sailed to Troy. During the fighting at Troy Meriones would often be found fighting alongside Idomeneus, but in his own right Meriones killed several Trojan heroes, including Phereclus, Hippotion, Morys, Adamas, Harpalion, Acamas, and Laogonus, and also two Amazons, Evandre and Themodosa. Meriones was certainly brave, for the Cretan hero offered to fight Hector, the greatest of the Trojan defenders, and also volunteered to accompany Diomedes when a scout of the Trojan camp was called for. Although Diomedes turned down Meriones in favour of Odysseus, Meriones also displayed generosity, for he equipped Odysseus for the task ahead, including giving him the prized helmet of Amyntor. This helmet had once been stolen by Autolycus, Odysseus’ grandfather, although Meriones inherited it from his father Molus. Meriones’ bravery was once again on display when the Cretan followed Patroclus on to the battlefield, as the Achaean’s, devoid of Achilles, sought to protect their ships. 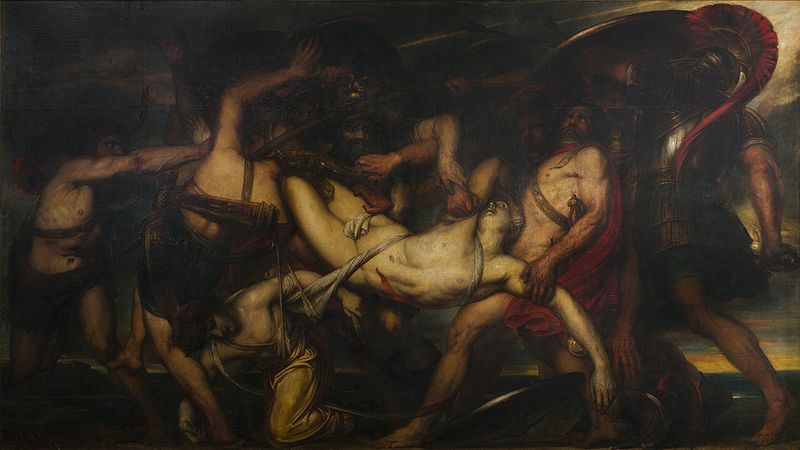 Patroclus would fall to the spear of Hector, but whilst the armour of Achilles was stripped from Patroclus, Meriones, fighting alongside Ajax the Great, prevented the body of Patroclus from being mistreated by the Trojans. Ajax the Great and Meriones would be joined by Ajax the Lesser and Menelaus, and it was Meriones and Menelaus who carried the body of Patroclus from the battlefield, back to the camp of Achilles. Meriones would also distinguish himself during the subsequent funeral games of Patroclus. In the first event, chariot racing, Meriones acquitted himself well coming fourth whilst Diomedes triumphed. In the seventh event, Meriones did far better, for the Cretan won the archery contest, defeating the famed archer Teucer in the process. The eighth event was to be a spear throwing contest between Agamemnon and Meriones, although the contest did not go ahead, for Achilles gave the prize to Agamemnon, recognising that the Mycenaean king had no equal in spear throwing. ​The skill of Meriones was sufficient to see him named as one of the heroes who was to enter the Trojan Horse, and thus when the Trojan celebrated, Meriones was one of the heroes who sacked Troy to bring about an end to the Trojan War. Sacrilege was committed by some during the sacking of Troy, most notably by Ajax the Lesser, but Meriones appears to be blameless in these events, and in early traditions it was said that both he and Idomeneus had easy journeys back to Troy. In these early traditions, Idomeneus continued to be king of Crete until his death, upon which time Meriones succeeded his uncle to the throne of Crete. Historically, this tale is backed up by the fact that the tombs of Idomeneus and Meriones were both said to be found in Knossos. ​Later traditions though decided that almost all of the Achaean heroes had difficulties on their return journeys, and in these tales, Meriones also does not return to his homeland. Meriones would be blown off course during a storm, and landed upon Sicily. Meriones though would find great welcome upon the island, for in the time of Minos, the land had been settled by Cretans. ​​Meriones would subsequently use his fighting skills, honed at Troy, to battle with the neighbours of the Cretan colonists, greatly enlarging the land under their control.